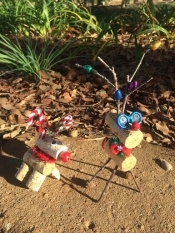 December 8, 2014 (Ramona) -- Kristin Kjaero snapped this pic of holiday ornaments made at a party for wine club members at Hacienda de las Rosa Winery in Ramona on Sunday. She titled her creation, decked out in sunglasses and holiday lighted antlers, "Climate adapted reindeer." Cheers!